WHY NOT BOOK A LUXURY SUITE, WHETHER A ROMANTIC GETAWAY, A SHORT BREAK OR WORK RELATED. FOR PURE LUXURY OUR SUITES MAKE IT THE IDEAL STAY IN THE HEART OF THE CITY CENTRE. STAY ONE NIGHT AND RECEIVE THE 2ND NIGHT HALF PRICE THEMED WITH AN AFTERNOON TEA AT NO ADDED COST IN OUR SUMPTUOUS COFFEE LOUNGE. Rates & Conditions: Junior Suite £240.00 per suite for the 1st night; &; £120 per suite the 2nd night. 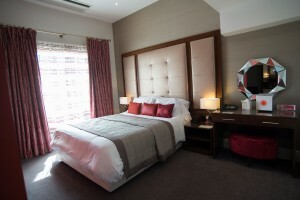 Deluxe Suite £259 per suite for the 1st night; & £129.50 per suite the 2nd night. Premier Suite £289.00 per suite for the 1st night; & £144.50 per suite the 2nd night. Minimum of two night’s stay. Valid any day of the week for the month of February and March 2018. To include our Full English Breakfast and V.A.T. Subject to availability at the time of booking. Rates are per Suite. This package is non-refundable if cancelled. Excludes Bank Holidays and Subject to Availability.